In my youth I was an oarsman, pursued adventure sports and had the potential to become an Olympic athlete. In later life I hiked in the Himalayas, trekked through the Amazon rain forrest and camped with the vanishing tribes in the Omo Valley in Ethiopia. I had never suffered a day’s illness is my sixty-one years on this earth and I never smoked or drank. I was the epitome of good health. Then suddenly; a short time after I returned from a photographic trip to Burma, everything went wrong! Twelve months ago, I was diagnosed with a very rare blood cancer called Multiple Myeloma. It manifested itself as a Plasmacytoma, which in layman terms is a tumour on the spine. If it remained undetected I would have been paralysed within a matter of months. Shortly after being diagnosed with cancer, my kidneys failed and a few months later I was only able to walk with the aid of crutches. In the intervening period I had spent months in hospital, been through countless medical tests and had numerous biopsies. I received Chemotheraphy, Radiotheraphy, Kidney Dialysis and in excess of thirty blood transfusions; and this all happened in a very short space of time. This photograph was taken after I finished a second round of very aggressive Chemotheraphy and just as I started an arduous program for a Stem Cell transplant. Further Chemotheraphy was scheduled before that transplant. The next phase of treatment would require a month’s isolation in hospital and many difficult months of illness were envisaged before I recovered from that ordeal. To photograph a patient undergoing such treatment is a delicate and challenging task. The photographer is constrained by the environment and restrictions imposed by medical priorities. There is a very fine line between the subtlety of a narrator and the jackboot of an intruder. A photographer is obliged to tread carefully to achieve an equilibrium and significant sensitivity is a prerequisite in such fragile circumstances. It’s difficult to achieve balance and remain emotionally detached when the subject is enduring pain and hardship. The photographer must remain objective and dispassionate in order to render an image that has impact and meaning. The main ingredients of a successful photograph are light, composition and form. It’s difficult for a photographer to be creative when working in a challenging environment and limited by key elements such as light and location. It’s even harder to achieve these fundamental requirements when the patient and the photographer are one of the same person. 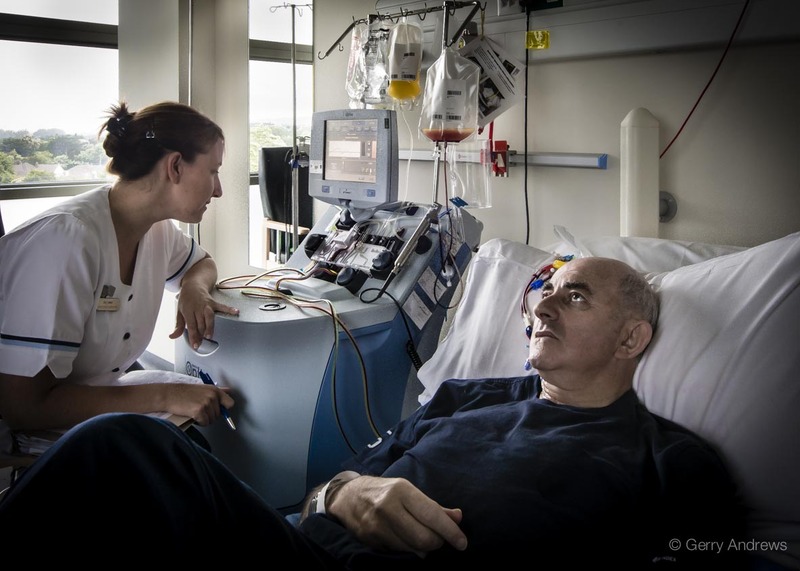 Encouraged by my consultant, I decided to produce a photo essay of my journey through the various phases of my treatment for this rare blood cancer. While the project appealed to me initially, I was very reluctant to take photographs during the early stages of my diagnosis. As a photographer, I wanted to capture images that told a story of resilience and fortitude. I wanted to make pictures that were dramatic and symbolic and which reflected the defiance required to overcome adversity. I wanted to make photographs that depicted a man who faced a solitary journey and revealed both his strength and vulnerability. Initially I thought that I could only achieve this objective if I photographed an independent subject. It took me a while to realise that I had to be my own subject if I was to be unconstrained by the ethos and etiquette of such a situation. It’s difficult to photograph emotion and pain. But it’s very challenging to capture images that have impact and meaning when you are in pain and fighting for your life. This venture has been the most testing project I have ever embarked upon and represents a work in progress. In truth, I don’t know how this is going to end but it’s that uncertainty that challenges my mental strength and creative ability. The only thing I’m certain about is that this self assignment will help define me as a photographer and as a man and it was that challenge which attracted me to the project in the first case. Time will tell if I succeed as both. My very best wishes with your treatment and recovery Gerry. And thank you for the bravery in sharing your words and images. I look forward to seeing them. Wishing you the fastest recovery Gerry , Hope to see you back in the club and your images on the wall soon. Best of luck Gerry looking forward to your talk and slidehow when project finished.If anything I can do for you ,or visit when allowed email me. I wish you the very very best in both journeys. I recently watched a repeat of the Nationwide programme in which you were featured. I thoroughly enjoyed your talks in Mallow and Dublin. You inspire as a photographer but even more so as a person. Thank you for your courage and your fortitude. From Limerick wishing the very best and a very speedy recovery to the Limerick man himself! Gerry, I wish you all the best for a full recovery. May I wish you luck on this journey. You continue to inspire us even from the hospital bed. I know my journey in this life is all the better for having shared some of the path with you. Your ability to express and inspire through not only photography, but also your command of the english language is truly a gift. Thank you for sharing that gift with us. I look forward to meeting up again at journey’s end. Best of luck. To Gerry with best wishes, Martin. Best wishes for a full recovery, Gerry. You and your images are both an inspiration to us all. Gerry, I have always found you an inspirational man and I hope that this documentary inspires other sufferers of serious illness to have the same positive outlook on life as you have. “Just Another Journey” it may be but I look forward to the day when you show and tell us all in person just how you found it.